A: The auction runs from approximately 8am until Noon on Thursday (the day after the swim). A: Seating is limited so you may want to bring your own chair. 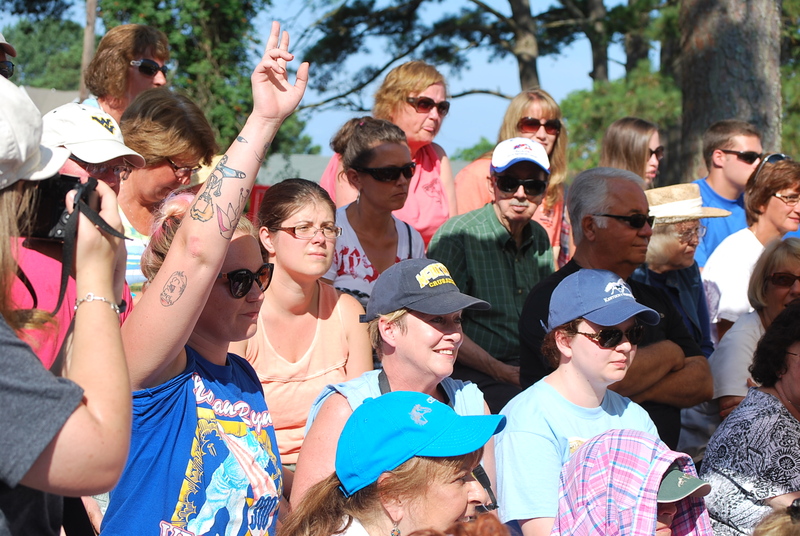 It’s usually hot and humid at the auction so bring water, sunscreen, a hat, and insect repellent. If you’re planning to bid note that acceptable forms of payment are Cash, Visa, and MasterCard only. Q: What’s the purpose of the auction? A: The auction helps to control the overall size of the herd, keeping it from growing too large. Each year the Chincoteague Volunteer Fire Company purchases a grazing permit from the National Fish & Wildlife Service. This permit allows the Fire Company to maintain a herd of approximately 150 adult ponies on Assateague Island. Each year about 60 foals are born on Assateague Island, VA. 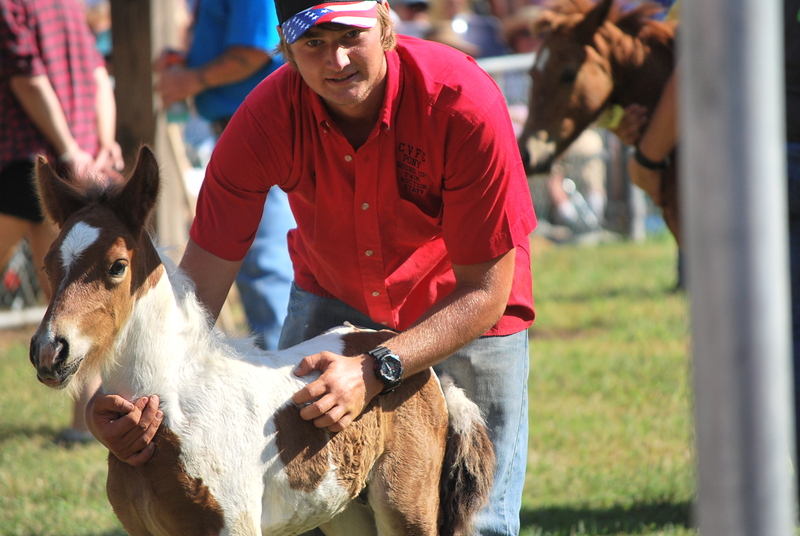 In order to keep the overall herd size at 150 adult ponies, most of the foals are sold at the auction. Q: Are the foals too young to be separated from their mothers? A: Only foals that are ready to be weened are separated from their mothers. Younger foals may be auctioned but they remain at the carnival grounds with their mothers until fall when the new owner picks them up. Q: What is the average age of the foals sold at the auction? A: Approximately 4 to 6 months. Q: What is a “Buy Back” Pony? A: Each year the Fire Company designates a select few ponies as “Buy Backs”. A Buy Back Pony is a foal that is designated by the Fire Company to return to Assateague Island to live out its life there. The Buy Back Pony will be auctioned with the rest of the foals. The winner of a Buy Back Pony will get to name the Pony before it is returned to Assateague. Buy Back Ponies replenish the herd on Assateague. Buy Back Ponies have actually become some of the highest priced ponies sold at the auction. Q: What does the Fire Company do with the money from the auction? A: The Fire Company uses the auction proceeds to purchase and maintain the equipment they use to fight fires on Chincoteague Island. In addition, proceeds from the auction to provide veterinary care for the ponies on Assateague Island throughout the year. Proceeds from the sale of one foal annually go to a regional charity. Q: What is the “Feather Fund”? A: Each year the Feather Fund helps deserving children purchase ponies at the auction. The Feather Fund is a charity that was created to honor the memory of Carollynn Suplee, a woman who came to Chincoteague annually to help children buy ponies at the auction until she passed away from cancer in 2003. To learn more visit www.featherfund.org. Q: How can I bid on a pony? A: You do not have to register. Anyone can bid. All you have to do is raise your hand! Q: Is transportation provided for the foals sold? A: No, but there are private individuals available to transport to almost anywhere in the U.S. for a fee. The charge is by the mile. Q: What do I need to transport my pony? A: An S.P.C.A. certified horse or stock trailer. Q: Does the fire company furnish halters? A: No, but they can be purchased at the auction site. Q: If I buy a pony, when do I have to move it? A: The fire company prefers you pick it up the day of the auction, or make other arrangements with the fire company. 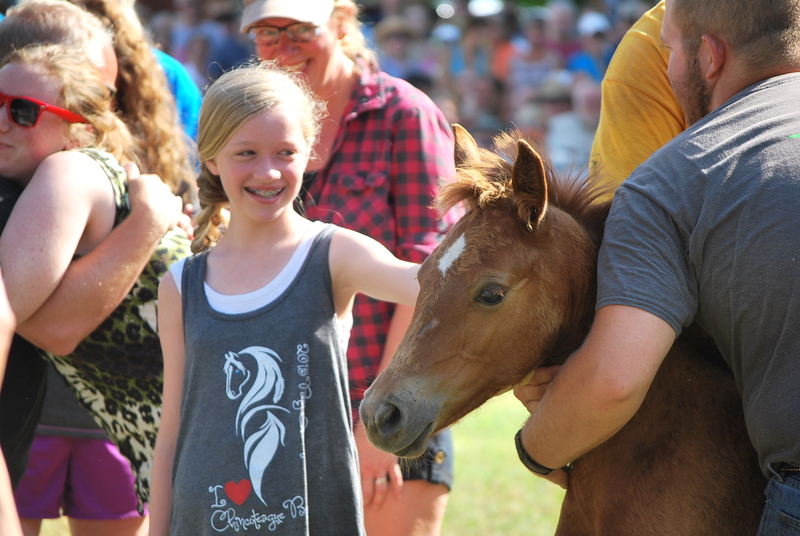 A: For general information about the Ponies visit our Chincoteague Pony web page. For more information about the Pony Swim please visit the Pony Swim Guide.